Standard tests, simple TEC verification - direct testing of actual TEC performance level (max parameters), comparison with TEC vendor estimations/datasheet values. Expert mode tests - detailed TEC analysis with direct performance and power consumption testing in operating conditions, specified by customer. Advanced comparison analysis of multiple TECs, optimal solution finding - direct testing of several provided samples to find the most optimal one, comparison of the performance level and power consumption at specified operating conditions. DX8020 TEC Expert System is the professional R&D system developed for comprehensive TEC performance analysis. It allows to measure all TEC key performance parameters and power consumption under specified conditions. It measures TEC key parameters directly and provides real, accurate and comprehensive information about TEC perfomance in vacuum and open air conditions. 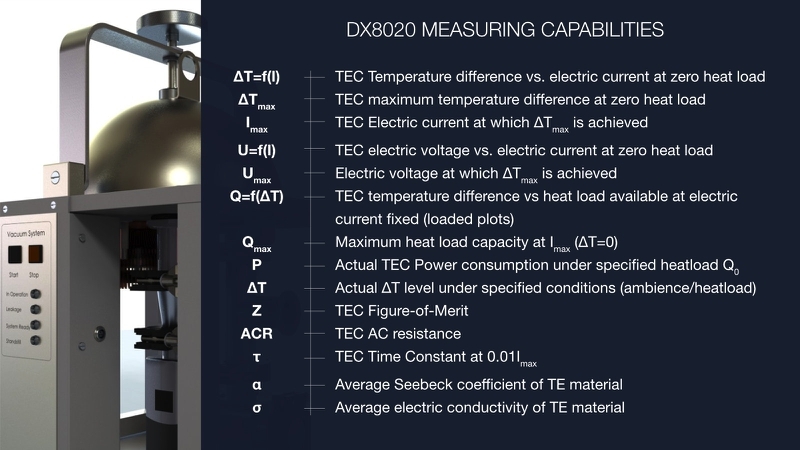 DX8020 TEC Expert System provides automatic capability to measure full specifications of a TE module at one measuring cycle. DX8020 is perfect for acceptance, qualification and research testing of single- and multistage TE coolers with dimensions up to 30x30mm2. Peltier Z-Meters™ are the best solution for thermoelectric coolers express quality control. Z-Meters provide fast and accurate measurements to get the complete info about thermoelectric cooler. The measuring process is based on Harman Method. Thermoelectric Generator Development Kit DX8130 is a tabletop laboratory for studying thermoelectric micro-generators (TEGs), testing their performance and operating parameters, TEG development and optimization of thermal energy conversion efficiency and accurate testing of TEGs in real operating conditions.